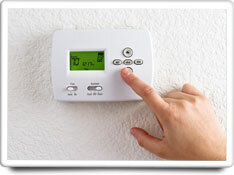 Ensuring proper operation of programmable thermostats helps to maximize energy savings. NOTE: The tasks and timings shown here for your Programmable Thermostat are based on a single-family home (owned), located in Massachusetts, United States, with priority set at ‘1 star' or higher, for all possible goals. If you set your personalization differently in your Home Wizard app, then you may get reminders for different tasks and timings in your recommended home care program for your Programmable Thermostat. battery with a new one. Check the clock to make sure it is showing the correct time. The benefits of this task are the convenience of having your automatic thermostat operating properly without interruption, which helps maximize energy savings. The cost of this task is very low. It is estimated that this task should only take about 30 minutes to complete, and the task is relatively easy to do. No specialized tools are required, but you will have needed to purchase the appropriate battery for your unit in advance.